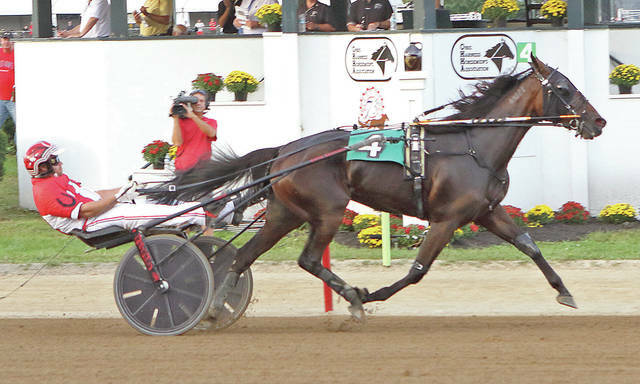 Impinktoo and Kayne Kauffman cruise to a 2 1/2 length win in the second $50,850 division of the Ohio Breeders Championship for three-year-old filly trotters Monday at the Delaware County Fair. Monday’s action at the Delaware County Fair featured the $101,700 (div) Ohio Breeders Championship for three-year-old filly trotters. In the second $50,850 division, Impinktoo and Kayne Kauffman took the lead before the ¼ mile pole and cruised to a 2 1/2 length win in 1:55 4/5. Sesame (Ryan Stahl) and Non Smoker (Dan Noble) rounded off the top three. The daughter of Manofmanymissions has earned $401,610 in her career for William Walters, Joe McLead and RTK Racing. Impinktoo is trained by Ron Burke. Risky Deal, with trainer Crist Hershberger in the bike, edged California Love (Aaron Merriman) by a neck in the first division. The Break The Bank K lass scored for the fifth time this season in a lifetime best 1:56. To Russia (Ryan Stahl) rounded out the trifecta. Risky Deal is owned by Deborah Kvernmo of Georgetown, Kentucky. The Monday undercard featured six divisions of the Buckeye Stallion Series for three-year-old colt and filly pacers. Dancin Dragon (Dan Noble) took the fastest of the three $15,000 colt divisions with his 1:53 win over Mcwiz (Kayne Kauffman) and Rock On Creek (Ryan Stahl). The Dragon Again gelding is owned by trainer Jim Arledge, Jr. and breeder Mark Marroletti. The other sophomore colt paces went to Long Train Runnin (Chris Page) in 1:53 2/5, Bambino Joe (Aaron Merriman) in 1:53 2/5 and Medoland Brutus (Kayne Kauffman) in 1:55 1/5. The two filly divisions were won by Our Miss Reese (Hugh Beatty) in 1:56 2/5 and Bringhomethemail (Dan Noble) in 1:57 1/5. Today’s 13-race card will start at 1 p.m. The simulcast show will begin at 12:30.